If Science Is From Hell, Where Are Politicians From? This would be troubling enough (an anti-science politician), but Broun is on the House Committee on Science, Space and Technology. Yes, this guy is making decisions that affect science in this country while also saying that science comes from hell. This is so wrong that I almost don’t know where to start. First of all, science is important to the future of our country. If we were to (magically) roll back our country to the 1800s, I doubt we’d be a leader in anything anymore. The United States would become a third world country which would be subject to the whims of other countries (like, for example, China or India) who put more emphasis on science and technology. Our modern life is impossible without science. Computers wouldn’t function if we didn’t have a very good handle on physics. Medicine would be useless without biology and chemistry. Cell phones would be expensive paper weights without many different branches of science which contribute to building and maintaining both them and the satellite networks that make them useful. We need representatives that will lead us into the future, not drag us back into the past. If you are on a science committee and declare that science is evil, this should be grounds to be kicked off the committee. It would be akin to a high ranking department of defense official saying we should totally disband our armed forces or a member of the SEC saying that insider trading really isn’t that big a deal. 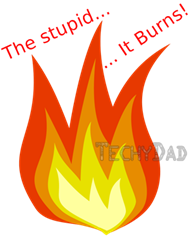 As the image above says: The Stupid… It Burns!! !